Although full of high hopes, the total newcomer, taking on his or her first garden, may feel a little insecure and lacking in confidence. Here before you lies your first ever plot of land. And for someone with no experience of outdoor plants or garden layout — where do you begin? What will you need in the way of tools? How will you know how to care for your plants if you cannot even identify them? What about fertilizers? If you have never had reason to lift a spade before, the list of possible questions is endless. Don’t panic, the situation is not as daunting as it may seem. No matter whether you are taking on a new or an established plot, generally speaking your aims will be the same. And these are to get your garden into some sort of workable order as soon as possible. Don’t be pressurized unduly by those around you. But do respect and don’t ignore local knowledge — it can be invaluable. These days the ground is usually left in a reasonable state after building operations. But it is certainly not unknown — although rare — to find little more than builders’ rubble outside your back door! Fortunately paths made and lawns laid is the normal state of affairs. And the owner is faced with the stark look of a brand new garden with its virgin grass and empty beds and borders. These need to be systematically prepared for planting. Bear in mind there may be many hours of preparatory work before planting can begin. One of the main points to watch is that there is sufficient depth of topsoil for deeper rooting trees and shrubs. Frequently, there is only a token demarcation at the boundaries, so walling and fencing may also need some thought. This may be the pride and joy of its previous owner, bursting with life in every corner and flower bed — or something a little more mundane. Either way, it is usually a matter of upgrading or making only minor adjustments in layout to suit the lifestyle of the new owner. Perhaps the best advice for any new gardener is ‘Don’t rush’. This is work which can be undertaken over a period of time. There is obviously less urgency than with empty beds. An established garden left to tick over for a while will continue to thrive at Nature’s own pace. Take rime to consider your needs. Perhaps the lawn needs extending — or a flower bed or two grassing over to reduce the workload? Conversely, enlarging the flower beds out into the lawn area may be an improvement? 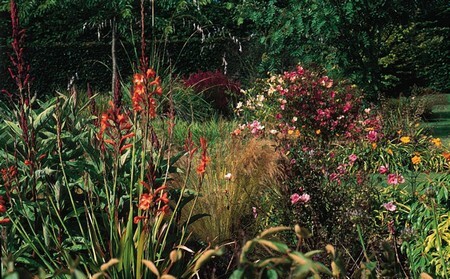 Most of you will want to replace the odd shrub or two with personal favourites. While running repairs will need to be made to fences and the like, don’t grub out shrubs if their identity is not known. Give them twelve months to see them through all seasons. Only then decide their true worth.